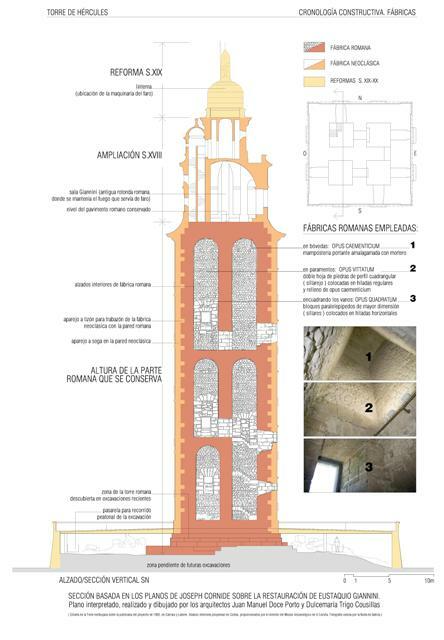 The inner core of the Roman lighthouse of Tower of Hercules still survives. It has the peculiarity of being arranged in three floors with four chambers per floor. This characteristic arrangement does not seem to be exclusive of the Tower of Hercules as other similar cases such as the no longer existing of Leptis Magna (Lybia-Africa), apparently had a similar arrangement of inner spaces. The Tower is arranged in three levels or floors of varying height: 9.20 m, 9.60 m and 14.35 m, respectively. Each floor presents a similar arrangement with four independent, rectangular chambers 2.70 m long, which form the floor. All these spaces had barrel vaults. Three of the, however, were removed when the interior staircase was built. 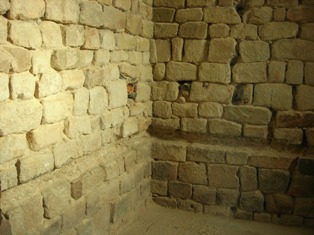 Partition walls are 1.5 m thick, which is the same width of the original perimeter walls of the Roman building core. Nowadays, these walls are thicker as the original construction was covered with a shell of impeccable masonry between 1788 and 1790 and the Roman structure was covered and united to this shell by means of perfectly fitted headers. The final result was 1.5 m width walls have now a thickness ranging between 2.10 or 2.15.m. Communication between the chambers of each of the three floors was originally made following a transverse east-west communication and always following a two-to-two pattern so as to prevent the four rooms in the same floor to be communicated. This was done to prevent the spreading of a potential fire as well as to favour resistance in the event of an attack. Access from the outside to each of these chambers was gained through the gates at the ascending ramp, which went around the core of the Tower and gave access its upper part. It is believed that firewood was taken up this ramp to fuel the fire that was lit to guide ships. The resort to an outside ramp has also been reported for lighthouse of Forum Julii or Frejus.